Zucchini, as it is most commonly know in America, is an Italian word. These veggies are known as "courgettes" in parts of Europe, and "vegetable marrow" in Britain. Other names include "long marrow" and "garden marrow". Zucchini is a summer squash, meaning the fruits have soft, edible skin. Summer squash are fast growers that can be harvested in 35 to 55 days. 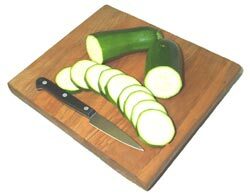 Zucchini squash is highly rated for economic value, based on the period of time between planting and harvest, as well as the number of pounds produced per square foot. Most plants yield an average of 3 to 9 pounds of young fruit. In recent years, zucchini has surpassed other types of summer squash in popularity as a fresh and cooked vegetable. Squash is a member of the cucurbita family, which includes melons, pumpkins, cucumbers, and gourds. There is a common misconception that these family members cross-pollinate (i.e., cucumbers will cross with pumpkins), however cross-pollination only occurs between varieties of the same species. Therefore, when more than one variety of the same species (in this case, C. pepo) are grown together in a garden they will easily cross, resulting in daughter plants with different fruit from either of the parents. So be forewarned if you plan to save seeds when planting your zucchini with varieties such as pumpkin, crookneck, or acorn squash! Archaeologists traced the origins of summer squash to Central America, ranging into Mexico and the northern parts of South America dating back to 5500 BC, where they were an integral part of the ancient diet. Within 50 years of the European colonization of the Americas, summer squash varieties were introduced in Europe. It is believed that the Italians then developed zucchini, giving it the name we now use. Generally, zucchini grows on bushy non-vining plants. Most commonly it bears cylindrical fruit, but new cultivars include round and intermediate shapes. Fruit color varies; from yellow tones to greens so dark they are nearly black. Many have speckles and/or stripes. Varieties may be classified by their bush habit, from an open habit where the leaves are more sprawling and widely spaced to a dense habit where leaves are crowded and harvesting is more difficult. The plant canopy on some varieties may change during the season due to plant nutrition, weather, irrigation and pollination. The leaves of the zucchini plant are large, dark green, and mature leaves are characterized by mottled silver-gray splotches and streaks on the leaf surface. These light markings are sometimes mistaken for a mildew problem. Squash plants produce male and female flowers on the same plant. The female squash flower has a miniature fruit at its base and is borne on a short stem. The male flower can be identified by its long slender stem and a stamen in the flower's center that provides pollen necessary to the development of fruit. If you look closely inside male and female flowers set side by side, you can easily see which is male and which is female. Before making your cultivar selection, determine your criteria. While earliness, prolific fruiting, and disease resistance are most important, other preferences might include fruit size, shape, color, and taste. Zucchini is easy to grow. In our desert conditions it can be planted in March and again in late August, allowing for two harvests per year. Optimal conditions for planting zucchini include the right location, proper soil preparation, and favorable temperatures. Being tropical in origin, summer squash is a frost-sensitive annual plant; temperatures over 70 degrees Fahrenheit are favorable for growth and development. Sunlight is essential, so locate plants in an area that receives 6 to 10 hours daily. The most common method of propagation is direct seeding into prepared beds. Although you can purchase starter plants from a nursery, more choices are available if you start from seed. Keep in mind that you only need a few seeds from any package-3 or 4 plants will sufficiently feed a small family. The seeds you save can be planted in the next few years, since most retain their viability for up to 4 years. After the danger of frost has passed, seeds should be planted to a depth of 1 inch in light-textured, well-drained soil. Seed germination requires a minimum soil temperature of 60 degrees Fahrenheit. The preferred soil pH range is 6.0 to 7.5. Generally plants are spaced at a minimum of 3 feet from center; however in intensive gardening situations this can be reduced to 1 1/2 to 2 feet between plants. Monitor plants closely and often for pests or disease. Be sure to look at the undersides of leaves where many zucchini pests reside. When planted in compost-rich soil where nutrients are released slowly, additional fertilizers may not be required. An organic liquid fertilizer such as liquid seaweed may be applied at 2- to 3-week intervals where soil isn't as fertile. Avoid high-nitrogen fertilizers; they will only encourage more leaves and stems. For best fruit production pollinate the zucchini flowers yourself early in the morning before the flowers close. The easiest way I've found is to cut a male flower from the plant, carefully remove the petals leaving the stamen intact, and then dab the stamen directly into the center of a female flower. Of course if you have plenty of bees or other beneficial insects around the garden, they will take care of pollination for you! Don't be discouraged at first if all you find are male flowers. Many times squash plants produce more males early in the season. It won't take long before you begin to see female flowers and can begin to anticipate the first fruits of your labor! Adequate soil moisture is very important, especially during flowering and fruit development. Soil should remain moist, drying slightly between waterings, but it should never be allowed to dry completely, nor should it remain too soggy. Avoid overhead watering-water the soil, not the leaves. Soil-borne diseases can cause problems to plants if water splashes up from the soil to the leaves. Water deeply (2 to 3 feet) once a week during the cooler weather, and increase watering to 2 or 3 times a week in the summer. Mulch heavily with organic material to help maintain and moderate soil moisture. Wilting leaves during the hottest part of a summer day are not always an indicator that the plant needs more water. When in doubt, check the soil. Common pests associated with summer squash are aphids, spider mites, squash vine borers, and whiteflies. Planting nasturtium with zucchini reduces aphid problems, however, nasturtium seeds are slow to germinate and should be planted before the squash. Insecticidal soap may be used to control aphids, spider mites, and whiteflies, but be sure to dilute the spray and refrain from spraying in the heat of the day because squash leaves may burn easily. It is wise to test a few leaves first before spraying the entire plant. And don't forget the undersides of leaves, where spider mites and whiteflies are usually found. To control squash vine borers, spray the base of stems once a week with Bacillus thuringiensis var. kurstaki. Common diseases include bacterial wilt, downy mildew, powdery mildew, and viruses. In the case of bacterial wilt, leaves begin to die. Cut the wilted stem and touch the tip of your knife to the sap. If it is milky and sticky, your plant is infected. Destroy infected plants immediately. Bacterial wilt, mildews and most viruses can be controlled or prevented with good cultural practices. Inspect plants often and control insect pests that can spread disease. Keep the garden clean and free of weeds and debris. Mildews can be reduced or prevented with proper watering and good air circulation. 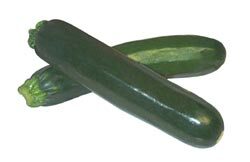 For the tenderest produce harvest zucchini at their immature stage when the rind is soft and seeds are underdeveloped. Fruits should be 6 to 8 inches long and 1 1/2 to 3 inches in diameter. Some varieties may be edible at even larger sizes. Delayed harvest results in further development of the fruit, causing toughness of the rind and hardening of the seed, contributing to loss of quality. It is important to keep zucchini picked, or fruit production slows. On the other hand, if you have so much zucchini that even the neighbors have had enough, leave one or two fruits on the plant to slow it down. Be sure to cut the fruit from the plant at the stem between the fruit and the main stem. Attempting to pull zucchini off the plant will usually damage the entire plant. For edible flowers, harvest early in the morning before they close, place them with their bases in water, and store in the fridge until you're ready to use them. Although zucchini is best eaten when fresh, it can be canned or frozen. Freshly harvested produce can be refrigerated up to 2 weeks. To Freeze: Shred unpeeled zucchini. Drain in a colander, and then pat dry with paper towel applying pressure to remove as much moisture as possible. Place 1 or 2 cups of zucchini in freezer bags and seal tightly. Frozen zucchini lasts about 3 months. All summer squash are a rich source of nutrients, especially the natural antioxidants beta-carotene, folic acid, and vitamins C and E. They contain healthful minerals including potassium, iron, calcium, magnesium, phosphate, copper, and zinc. Research has shown that squash seeds also contain traces of cancer-preventing substances, known as protease trypsin inhibitors, which inhibit activation of viruses and carcinogens in the digestive tract. One-half cup of boiled zucchini has only 18 calories, 0.3 grams of fat, and 1.0 mg of sodium. Each half-cup serving provides 0.8 grams of protein, 3.9 grams of carbohydrate, and 1.3 grams of dietary fiber. Bartholomew, Mel. Square Foot Gardening. Rodale Press. 1981. Brookbank, George. Desert Gardening, Fruits and Vegetables, The Complete Guide. Fisher Books. 1991. Cromell, Guy, & Bradley. Desert Gardening for Beginners. How to Grow Vegetables, Flowers, and Herbs in an Arid Climate. Arizona Master Gardener Press. 1999. Jeavons, John. How to Grow More Vegetables. 5th Ed. Ten Speed Press. 1995. McIntyre, Anne. The Good Health Garden. The Reader's Digest Association, Inc. 1998. McMahon, Kofranek, Rubatzky. Hartmann's Plant Science. 3rd Ed. Prentice Hall. 2002. Owens, Dave. Extreme Gardening, How to Grow Organic in the Hostile Deserts. Poco Verde Landscape. 2000. The Organic Gardener's Handbook of Natural Insect and Disease Control (Multiple contributing writers) Edited by Barbara W. Ellis and Fern Marshall Bradley. Rodale Press. 1996.